The water level of Zuixian Lake, also known as Hongmen reservoir, was lowered by more than 30 feet due to a project to renovate a hydropower gate. 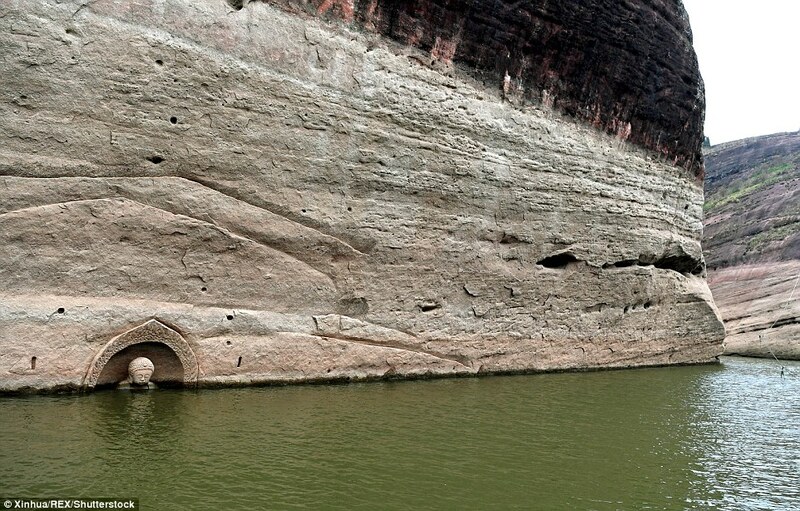 The dramatic change in the water level has led the mysterious Buddha statue, which was carved on a cliff face, to appear. The statue seems to depict the image of the Gautama Buddha. 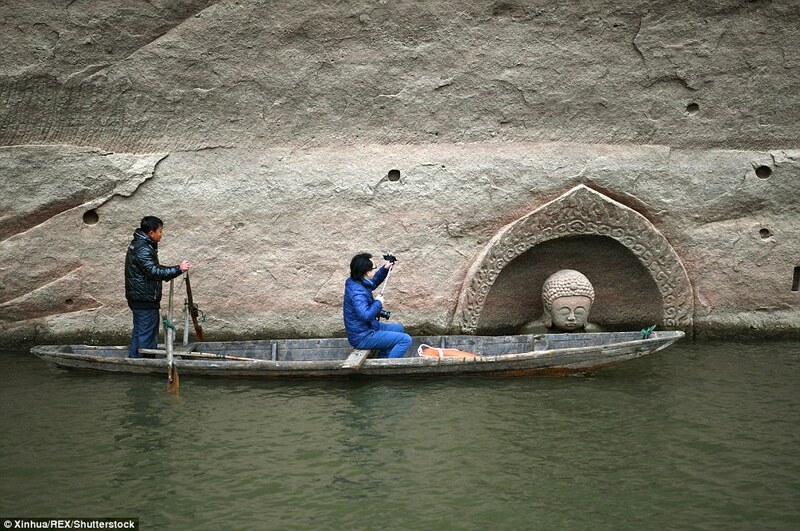 In addition to the statue, villagers also found an imperial decree carved into the stone, Xinhua reported. 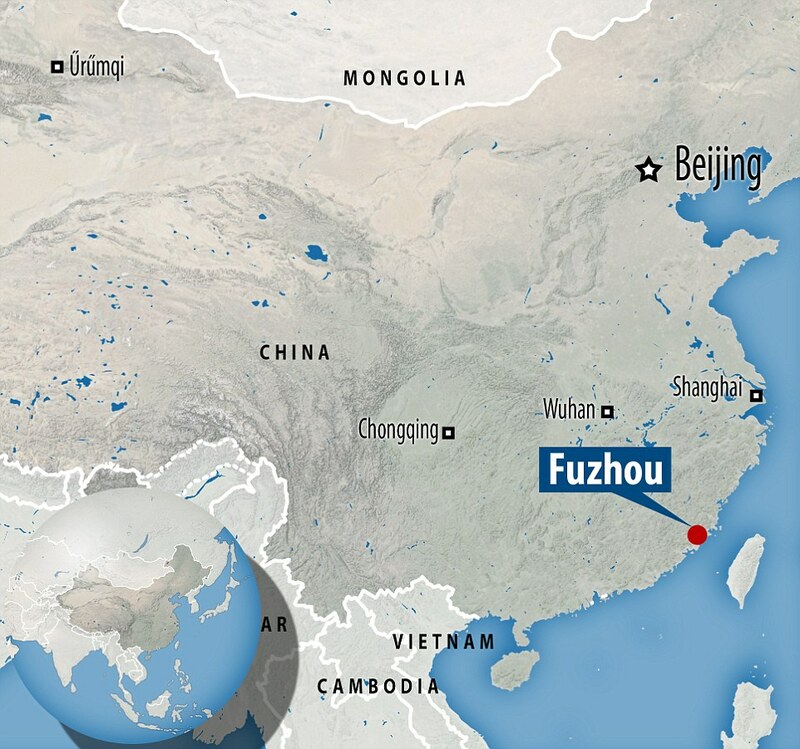 After the local made the discovery, archaeologists have arrived at the Nancheng County to start an underwater detection project. Archaeologists also found rectangular holes carved on the cliff. They believed that the holes could provided proof that a temple had existed in the area. The Hongmen Reservoir contains 1.2 billion cubic meters of water and has more than 1,000 islands. According to Nancheng County’s governmental website, it was located on the site of an ancient town known as Xiaoshi. When the reservoir was built in 1958, 63 towns and villages, including Xiaoshi were completely submerged to create the lake. The town had held the governmental seat of Nancheng County for nearly 500 years. 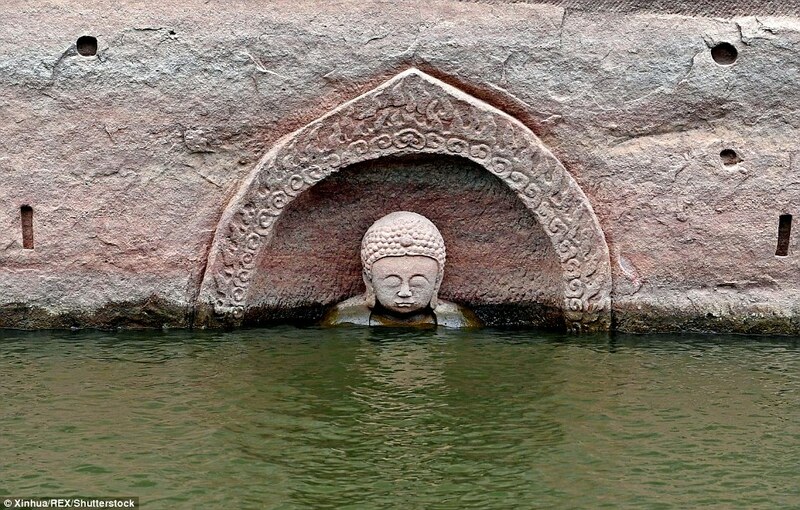 The underwater detection project in Hongmen Reservoir is expected to last until January 15. 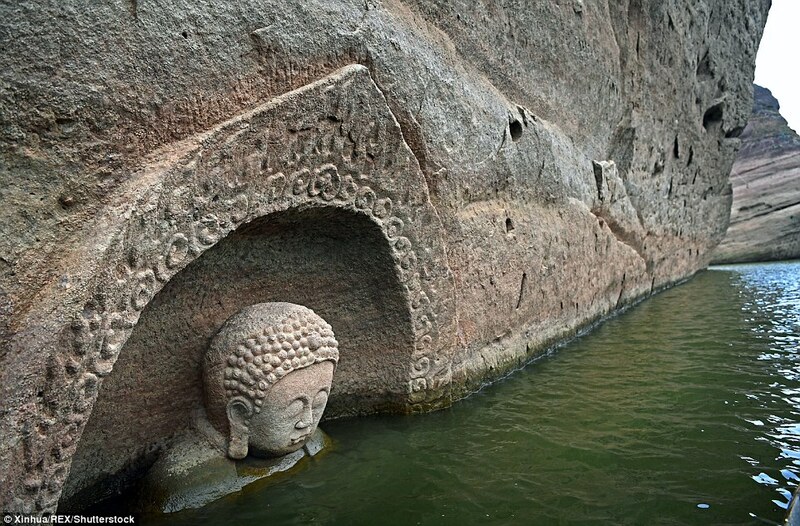 The mysterious Buddha statue is not the only relic which has been discovered under a reservoir in China. 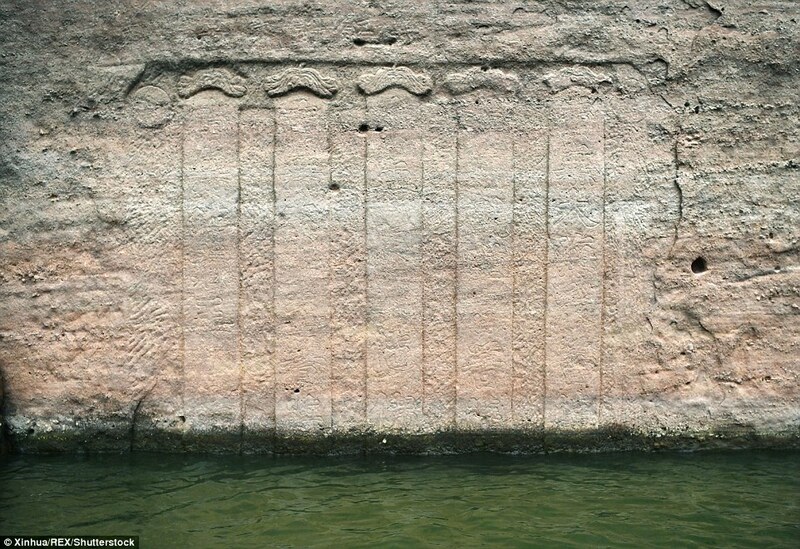 The most famous finding yet is the Lion City, a town which hid under the surface of Qiandao Lake, in eastern China’s Zhejiang Province, for more than 50 years. A maze of white temples, memorial arches, paved roads, and houses… hidden 130 feet underwater: this is China’s real-life Atlantis. Lion City, tucked in a lake between the Five Lion Mountain, was once the centre of politics and economics in Chun’an County. But in 1959, the Chinese government decided a new hydroelectric power station, named Xinanjiang, was required. So authorities flooded the Lion City, and the nearby He City, in order to build a man-made lake. Erecting a dam, the historical metropolis was slowly filled with water until it was completely submerged by the turquoise-blue mass now referred to as Qiandao Lake. Depending on where on the lake bottom it is, the city is between 85 and 131 feet underwater. And it lay forgotten for 53 years.